Silver plated three bottle decanter stand, 19th century, with three matching decanters with hollow stoppers, single ring to the neck above the faceted shoulder with a pierced stand with beaded handle supported upon foliate scrolling feet Measures: 17" height x 7" diameter. 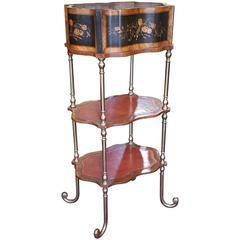 A Louis XIV style two-tier plant stand with marble top, reeded legs and ormolu decoration, early 20th century Measure: 12" x 12" x 33". Set of four three circa 1930 clear glass liquor decanter bottles with clear original stopper tops. Midcentury, cobalt glass, decanter with stopper features hand-painted, sterling silver foliate details. Round Cut Crystal Decanter - a handsome and unique decanter ready for the stylish bar or to store you favorite candy in!? Decorative decanter by Holmegaard, Denmark, circa 1950.